Julia Grant is a widow with a six year old child. She is also a defense attorney, and damned good at her job. She works long and hard for her clients, yet never loses touch with the fact that her daughter needs her even more than the clients do. Julia has a blurred past, a period of time that she cannot recall in detail, it is so painful she has blocked it from her mind. Her life is incomplete. Julia’s new client holds a key…a key that may unlock the terror her mind has refused to remember. What is this connection between her and this murderer…why does she feel so compelled to help him? In spite of her best efforts the case goes wrong. He is found guilty and sentenced. The man “Sam Smith” turns on her, threatens her life and that of her child, he is vicious in his desire to punish her for failing to gain his freedom. Author Sheila Mary Taylor has written an exciting, well researched and fast paced psychological thriller. You can feel the menace emanating from her client. I have no wish to give away the meticulous crafting of this plotline, suffice it to say that Sam Smith is far more than he appears to be. He has a connection to her…but what could it be? The author lulls us into a sense of well being, the man cannot wreak his bitterly voiced revenge on Julia from behind prison bars, we breathe a sigh of relief…we breathe a sigh too soon. He escapes on his way to lock up. My pulse rate took a while to settle down even after the thrilling conclusion. I refuse to spoil this for you. The ending and the climactic journey to reach it is some of the best thriller writing I have read in a very long time. A must read 5/5 ranking. Welcome again Sheila, we last chatted before “Pinpoint” was released, I have had the enormous pleasure of reviewing your book and am delighted that you have found the time to chat to me about life since publication, and the preparation you underwent before writing this gripping psychological drama. Hi Soooz, I am thrilled to be interviewed by such a remarkable writer as yourself. Humbled really, when I think how much you have done with your life and how much you have done to help fellow writers, and I’m honoured to be included on your prestigious site. Tell me, is it true that you were actually smuggled in to Strangeways Prison to witness a consultation with a murderer? It’s something I will never forget. The agonizing yells that reached my ears despite the thick walls of this notorious Manchester prison, the smells and the sense of impending doom will stay with me forever. I was lucky that a wonderful criminal lawyer friend of mine introduced me to a female colleague of his, also a criminal defense lawyer. I’m not sure how she got away with it, for casual bystanders are definitely not allowed in to interview rooms in Strangeways Prison. But somehow she passed me off as her legal assistant. I had strict instructions from her: Don’t say a single word. Don’t take a single note. Don’t move or in any way distract the accused man. Well, I can tell you that in spite of the excitement of sitting motionless in a corner of that tiny room, never before have I been able to keep inside my head so many explosive words. Immediately after the interview I fled to my car, yanked my notebook and pen out of my handbag and wrote down – I’m sure almost word for word – the entire interview. As in all research only a smattering of what you learn ever reaches the pages of your book, but in this case there are big chunks of that interview carefully interwoven into both the dialogue and the prose of Pinpoint. I had to be careful not to let it resemble the real case. And in a way there is something of this real lawyer in my main character, Julia, but only in the steeliness of the way she conducted that interview. Otherwise they are totally different. Novelists seldom lift a real live person into their novels; they are always a composite mixture of people they have known or seen on TV or read about. And sometimes of course they are a product of pure imagination, as most of my characters are. I believe you also masqueraded as a social worker in a very dangerous area to gain more insight for your book. Can you share with my readers that experience and why you went to such lengths to research this work? I don’t like novels set in fictitious places and wanted my novel to be in a real live place I knew well. In this kind of novel, although there is always a certain amount of “artistic licence” you can get away with, I had to portray real places and real situations from a first hand perspective, and only when I started writing I realized I didn’t really know this area well at all – not all the places I was going to use anyway, like prisons, slum areas, seedy night clubs and police stations. But I didn’t want readers coming back to me and saying I’d got it all wrong. It’s amazing how you develop a kind of armor when researching. Your passion for your novel gives you a rigid one-tracked goal, and I found that this newly found strength sealed me against the inhibitions I would normally have had. If you had told me before I wrote Pinpoint that shy little me would brazenly knock on somebody’s door in a place like Moss Side, I would have laughed. But that’s just what I did. I took a chance. And this time I was on my own, unlike the prison visit where I was escorted. I had a pretty smart professional looking name-badge I’d been given at a Rotary International Conference when I’d given a talk on my book about my son Andrew’s amazing fight against teenage cancer, the proceeds of which were going to Sargent Cancer Care for Children. I slid a carefully printed fictitious name into this badge, Abigail Jones I called myself, pinned it on my lapel, crossed my fingers, drove up and down a particularly dilapidated street and chose a door that looked worse than all the others. I had no idea how social workers went about their work, but I reckoned on this occupant not knowing either. What happened next is all in the scene where Julia goes to her client Charlie Kuma’s house – except that in reality I announced that I was doing a survey for the General Social Care Council on how satisfied people in this area were with the care they received. I had a clip-board under my arm and though reluctantly allowed to enter this hell-hole of a house, I was not well received. I asked a few inane questions - like was she ever able to go out on her own to shop without the children, who all seemed to be push-chair age. Mostly she just laughed at my questions or sneered. I put ticks and crosses on my clip-board and left, with exactly the kind of emotions I gave Julia when she left that house, although of course Julia’s questions were quite different from mine. I couldn’t believe people lived like that in England. What other areas did you research on such a personal level? There were many. The ride in the ambulance, when the paramedic bent over backwards to explain and demonstrate to me the exact procedure if someone was shot in the leg. These men are so dedicated to their job and strike me as being as knowledgeable as both doctors and nurses wrapped up together. Then a meeting with an orthopaedic consultant at the very hospital Julia is taken to after she is shot, although I did know about broken fibulas as I had recently broken mine slipping on a grassy slope! He told me everything I wanted to know. I also spent time wandering around the A & E department, watching when casualties were brought in, and then slipping up to the orthopaedic surgical ward and chatting to a nurse. Nobody stopped me. The visit to the head-quarters of the Manchester Metropolitan Police – the result of a personal letter I wrote to the Chief Detective Superintendant (you see, you need a lot of cheek when you’re researching an unknown area of expertise. The trick is to always go to the top, say you are writing a novel, and they can’t do enough for you! ), who then phoned and invited me to see him in his office. Hey presto! I was given an official pass and had my first-hand knowledge of the police headquarters handed to me on a plate: the Detective Superintendent’s office, the view from his window – oh, I didn’t miss a thing. Some on my tape recorder (always have a tape recorder handy, but ask first if they mind), some in my notebook, jotted down without looking in my special hieroglyphics, and some just in my head. He told me a lot about procedure, but when it came to the real nitty-gritty police procedural scenes I had the amazing fortune to meet a real live retired Detective Chief Superintendent in Menorca. Who has become one of my best friends! He was amazing and told me much more than I needed to know. And it was through his eyes that I wrote the scenes in my fictitious night club in Moss Side, because the only night-clubs I had ever been in were those high-class ones in Cape Town when as a teenager I was part of a roller-skating team which gave skating demonstrations. He gave me a blow by blow description of a typical club, although I used my imagination to envisage the actual scene. This was the only place in the novel I didn’t actually see myself. What now? Guns. My youngest son shoots for Cambridge County and the RAF Volunteer Reserve teams, so I was able to handle a real gun and learn how to load it and use it. Cold horrible things that I could never dream of using, and I gave Julia this same abhorrence of the weapons. I enrolled in a Self-Protection course and those scenes were exactly as I experienced them myself. I had a tape recorder on the floor recording the entire proceedings! And I loved the real-live fight I had to have with the instructor. I gave it everything I had. And now I’m not afraid to walk down a deserted street at midnight! You must think I’m mad, but I really did walk along the then derelict banks of the Rochdale Canal in Manchester. And I did go on my own into the pub where Sam Smith staggers in to have a half-pint of bitter. And I did cross over the bridge and go into the burnt-out remains of a warehouse on the banks of the canal, where I found the dirty old mutton-cloth Sam wraps around his stomach. I sat on the uneven dirt floor and saw the remains of someone having spent the night there, cigarette butts, an empty beer can - some desperate vagrant no doubt. But what I did not see was the rat, although I saw its droppings. And I have never dissected a rat. That was pure imagination. I could write a book about my research, but I’m sure you’ve got the gist of how thorough I was. You obviously felt the need to expose yourself to some horrible situations, and it is reflected in the work itself. The flow of the story doesn’t stop, there appears to be a complete affinity with your character of Julia, did you find her difficult to write? I had a big chart on my study wall, with dates, days of the week and times and little squares for each of these. I only did this once I had got into the story and knew more or less where it was going, I needed to keep track of the different characters’ movements, otherwise I’d have landed myself in a big muddle. So I kept this chart up to date with what all the main characters were doing and where they were, and amazingly it helped too with what motivated Julia. It helped me to see where she was going and what she would have to do next and what she was thinking. I read a lot about twins and about adopted children. The subject fascinated me. I also researched amnesia. I almost didn’t write the novel because I became so engrossed in the research. Which I’m in danger of doing again now because talking to you it’s all coming back to me! It was different getting to know “Sam”. I went to the local library where I knew one of the librarians had once worked in a prison. She had also helped to encourage the inmates to write about themselves and their experiences. She gave me copies of some prison writings and I was amazed at the talent some of them showed. What was so refreshing was the complete honesty and openness of the writing. There was no holding back. I realized that I had to give Sam this same free voice, without any inhibitions. I’m sorry about all the swear words he uses, but that’s really the way they speak. Apart from these writings, I also read a lot about the emotional make-up of serial killers, and also of abandoned children in care. Sam missed his sister as much as she missed him, I was sure. And in spite of his undoubted intelligence his upbringing after he was separated from his twin gave him no incentive or opportunity to put anybody else’s interests before his own, although it is obvious that at one time he would have done just that for his lost twin sister – whoever she was. It’s a strange thing, but I grew to like Sam. I was desperately sorry for him. I knew there was far more to him than the police saw on the surface, and even what he allowed Julia to see when she was defending him, and when he was persecuting her. But I had to be careful about how much sympathy I showed towards him, because, after all, he had committed some unspeakable crimes. I’m a great believer in nurture having a greater influence that nature in molding a person’s character and behavior and thinking, although there is much to be said about both influences. Sam’s subsequent behavior was testament to this. Police procedures and courtroom etiquette is drawn beautifully. More inside knowledge? Well, that was one of the bits of research I enjoyed the most. Day after day I would go to the Manchester Crown Court and the Magistrate’s Court and sit for hours watching and listening and taking notes. In some cases, you were not allowed to take notes, but always the proceedings were so dramatic that I was able to write them down as soon as I got outside the court. Some of the Crown Court cases lasted weeks rather than days, so it was rather like going to a serial crime show – you couldn’t wait to find out what was going to happen next. It’s strange how they always make sure the defendants are clean and smartly dressed in the witness box, so that often you had to wonder how on earth they had done the ghastly crimes of which they’d been accused. And of course – sometimes they hadn’t, or there was a very good reason why they had. For the police station scenes I phoned a local police station, the very one where Sam’s accomplice Joe Sagoe is incarcerated, and they welcomed me with open arms, took me down into the cells, introduced me to the custody sergeant, and let me sit down in one of the interview rooms, all of which helped to stir the creative juices. So I knew exactly what it all looked like and how it smelled and sounded. My wonderful retired policeman friend in Menorca filled in any gaps I had. And so did my fabulous criminal lawyer friend. Whose vast knowledge covered not only the law side of things but also valuable police details that provided much of the conflict between Julia and her lover, the policeman Paul Moxon. He not only read the entire manuscript and corrected much of my terminology, but provided an extra vital nuance that only someone in his position would have been able to perceive. To these two individuals I owe an enormous gratitude. The reviews on the book are excellent, and I agree wholeheartedly with them. I found the work difficult to put down. Tell me , did you find it exhausting to write on this type of heavily emotional level? I was so involved in the lives of the characters that I never found it exhausting because to me I was a part of it. I’m a very early riser (early to bed and early to rise makes . . . ) and I have always found the earliest hours of the morning the best for the creative part of the writing. As soon as I wake up I get up, switch on the computer and get into the scene as quickly as I can, usually with the words already on the tip of my tongue. I get so involved in my story that I can’t wait to find out what happens next. What’s up next for you…anything else tucked away that you are working on? I would really like to write another psychological crime thriller, and I will one day soon. But I’ve been working on a new novel – Entangled – on and off for a few years now, one that has been waiting to be written for years, and I will finish it first. When I put Pinpoint on Authonomy Entangled was almost finished, but had to take a back seat because of all the work I had to do to get to the Authonomy Editor’s Desk. Entangled is the kind of book that demands total absorption in its characters – just as Pinpoint did. Please tell my readers where else they may look at your work, and your websites and links. Pinpoint is published by Night Publishing. It is available in paperback and Kindle versions from Amazon.com, and in Kindle version from Amazon.co.uk and from Smashwords. My four romance novels are now out of print although they are still available from Amazon.co.uk and Amazon.com. However they will soon be published as e-books. The titles – all by Sheila Belshaw - are: Diamonds of the Sun (set in the Seychelles); The Nightingale Will Sing (set in Menorca); Savage Paradise and Shadow of the Flame (both set in Zambia). Fly With a Miracle is the true story of my youngest son, Andrew, who fought bravely against teenage cancer. Although this is still available on Amazon.com and Amazon.co.uk, the publishing rights have been reverted to me and I’m about to load the first 10,000 words on to Authonomy, as my plan is to re-write the book and have it published with a new title and a new cover. I am well into this re-write and am excited about its imminent re-publication. Thanks so much for joining me today. 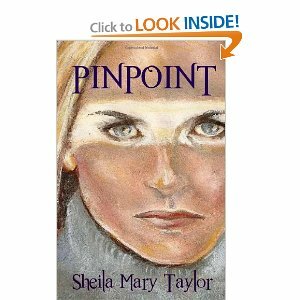 I have no hesitation recommending “Pinpoint” to my readers. Thank you too, Soooz, for giving me the opportunity to talk to you. And thank you for your wonderful review and your invaluable recommendation. A book I loved on Authonomy, and rushed to buy as soon as it was published. Gripping, thrilling and with characters to love! Enthusiastically recommended.